Ennerdale Brewery’s CAMRA liaison officer George Bruce works hard to support the Motor Neuron Disease Association in Cumbria. We had fun being part of a fundraising race night where more than a few pints of real ale were enjoyed at The Fox and Hounds. 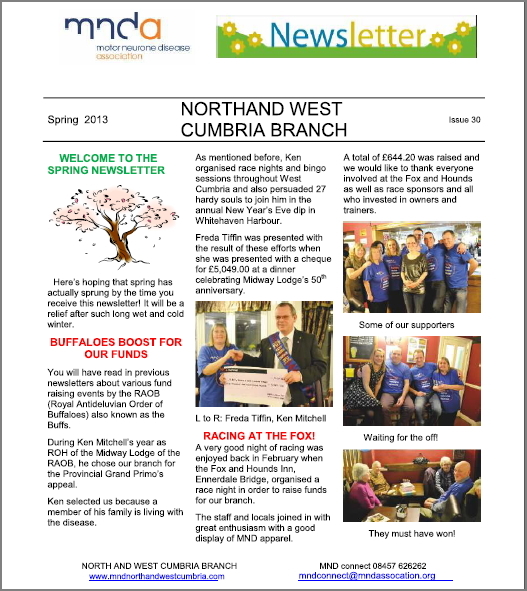 Over £600 was raised at this event, and as you’ll see from the newsletter the MNDA branch efforts raise substantial sums across the county. There are socials coming up in mid May and June, and there’s also a new opportunity to become a “Friend of the Association” which is free and allows you to join in the online community without a membership commitment. Click here or on the image to read more. There’s also a “Food for Thought” piece in there that made us laugh…. take a look when you have a moment! If you’d like to visit the MNDA website follow this link. To find out more about upcoming events with The Ennerdale Brewery join us on Facebook & Twitter. Or click on the Fox and Hounds link above for more on the Ennerdale Community Hub.